Round 5 saw us tackle the APR up in Whigstreet. It was a great night with a smashing turnout of 28 riders, the weather was excellent also. Congrats to Ross, you’ll be bumped up the grouping next time round for that effort!! 28th – Helen Collins with a slight detour? Round 6 was the 10 mile Club Time Trial Champs on the tricky corkscrew course form Arbirlot. The weather was wet, windy and altogether miserable however it didn’t put off the 23 riders. Stewart Irving is the club 10 TT Champ with his wife Pam the female winner! Stewart took the race by 10 and 13 seconds respectively from Peter Flick and Euan Ritchie. Pam had a close run contest with Michelle Mackay in the absence of former winner Ingrid Kidd. Runner, swimmer and cyclist, more commonly known as a triathlete, excelling in no discipline! Angus Bike Chain Cycling Club shared Stephan Delaney's post. Hello All Angus Bike Chain Cycling Club members and supporters. The 9th of December is the start of the Angus Bike Chain CC Monikie Park Winter Series of Duathlons held in Monikie and on the surrounding roads. I have been organising these events for the last 7 years with great success and well supported by the Club. There has also been lots of great feedback from the competitors who come from far afield, ranging from Greenock, Glasgow, Edinburgh, Aberdeen, Perth - as well as those from the local area. I need your support to make these events successful and also for the competitors who have paid to race on the day. Competitors fees bring in valuable income into the club and also this also shows that Angus Bike Chain can put on a great event - so your support is required. I do know that some times we can get oversubscribed with volunteers however this happens as I am not informed as to who is turning up or not. Can you please inform me if you are coming or not. Tea and coffee will be provided as well as soup and rolls for all who help out. The sessions start again on Monday 26th November, 7.30 to 9pm. 60 mins or so on the bike work followed by 20 mins of core strength/ range of movement and stretching. The sessions are are free to club members and will be planned to be progressive, targeting various components of fitness relevant for all levels of cyclist looking to improve. No-one gets left behind at a turbo session and everyone works at their own level. Non members £5 per session. The first 4 sessions up to the festive season and then early into the new year will target on the bike strength and muscular endurance before transitioning to power then speed. Is it high intensity? Yes it is but that is a relative term for each individual. Dates 26/11, 3,10, 17/12, then 7/01 to 25/03/19. Stay hydrated throughout, bring a towel and a dry t-shirt to change into afterwards. Anyone looking for a turbo should check out John Milne's post on the group page selling one. 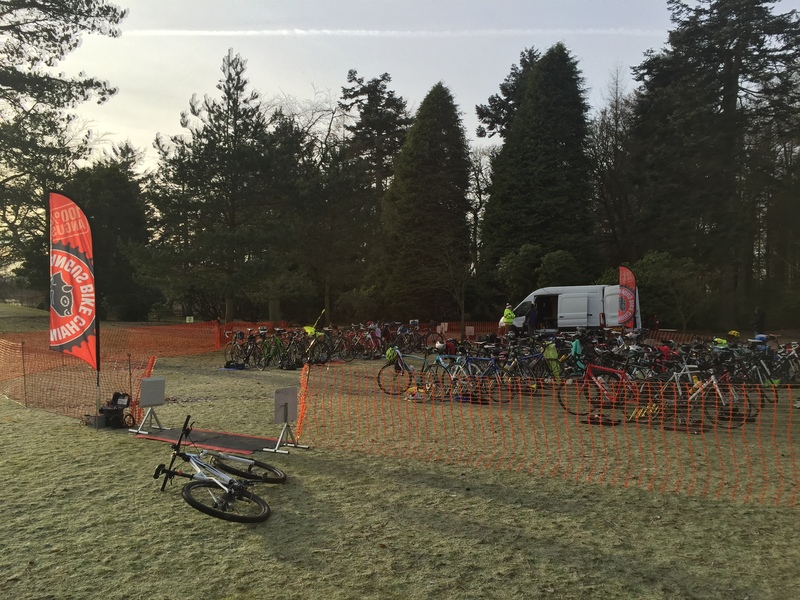 It’s just over 3 weeks until the first round of the ABC Winter Duathlon Series at Monikie park. The first round on December 9th is a 4km run round both reservoirs in the park followed by a cycle of a 21km loop to the North of the park. Copyright © 2012 - Angus Bike Chain Cycle Club. All rights reserved.